Our winter down here in the Cape has been so pleasant with crisp mornings, warm sunny days, clear mountain views, calm oceans and glassy rivers, that we thought we'd invite you to enjoy this magnificent time of the year with us. Come on holiday and join us kayaking on the Knysna Lagoon, hiking in the forests, trekking in the Swartberg mountains or Rock climbing in the Cape sun. If you can't get down here for this vacation, plan you time and join us on one of South Africa's premier Slack Packing trails, THE WHALE TRAIL in September. We have places available for the trail starting on the 29th of September 2013, it's 6 days of beautiful scenery, great food and relaxing hiking. Also in September or early October we recommend joining us to do the SWARTBERG TRAIL. Backpacking from hut to hut, this multi-day trails winds through some of the most beautiful Cape mountain scenery and the great attraction in September and October is the multitude of indigenous fynbos and proteas that will be flowering. A very special hike! 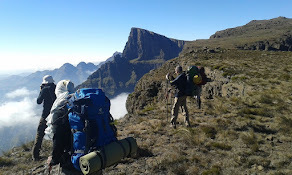 We have some great trekking in the Drakensberg lined up; NORTHERN DRAKENSBERG TRAVERSE 23 to 28th October, GRAND TRAVERSE 4th Nov to 17th Nov, AMPHITHEATRE TREK 17 to 19 October, (short 2 day version on 27 & 28th July), and THABANA NTLENYANA 4 day Kili training trip on 12 - 15th October and for the Peak baggers out there, our 5 day trek that conquers South Africa’s 3 highest peaks Champagne Castle 3377m, Injasuthi Dome 3410m, Mafadi 3452m, is proving to be very popular, email us for the details. We are holding an Abseil and Rock climbing guide course combined course over 5 days IN JOHANNESBURG This course is training for entry level professional adventure guide qualifications. You can do only Abseil or Climbing or take advantage of the discounted combined course. Email us for details. We hope you're going to enjoy your winter in the warmest most energetic way possible.